Soft and creamy desserts are perfect to serve at the end of a dinner or lunch. The recipe proposed is very simple: a variant of Zuppa Inglese, a dessert that is very popular in Italy. It is important to have good quality ladyfingers for this recipe. I advise you to use ladyfingers that are wide and flat. It is easy to prepare this trifle, even by children. My son experimented with this recipe while he was working in Boston and it became very popular among his friends and colleagues. Boil the milk with a piece of orange peel, taking care not to cut into too much of the white part since it can make it taste bitter. Turn off the heat when it comes to a boil. Add the egg yolks and sugar to a bowl. Working vigorously with a wooden spoon until they become fluffy and beautiful white. You can also use the electric whips. Add the cornstarch and stir again. Remove the orange peel from the milk and pour in the egg mixture, stirring constantly. When everything is melted and well blended, turn on the burner and stir to thicken. It should take about 3-4 minutes from when the mixture starts to boil. Turn off the heat and pour the cream into a large bowl. Allow to cool, stirring occasionally. Meanwhile, using an electric blender, whip the cream and add a drop or two of vanilla extract, then stir in half of the cooled cream. Keep the remaining cream in the fridge, it will serve for the final decoration. Open the jars of pineapple, separate the liquid and the pineapple slices, pouring each into separate bowls. (You will use to liquid to soak the ladyfingers). 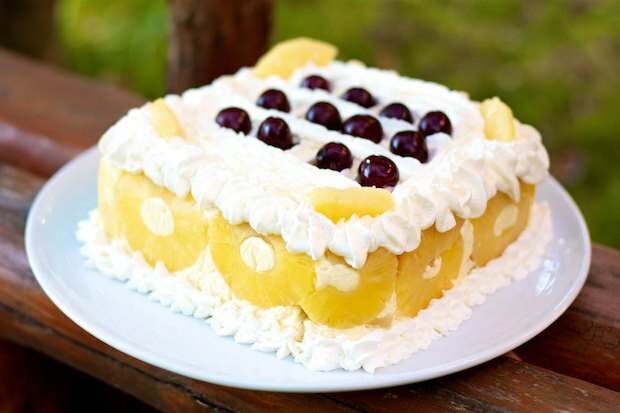 Line a cake mold with plastic wrap then place the slices of pineapple on the bottom and sides, and cut the remaining slices into cubes. Add a thin layer of cream and then the ladyfingers soaked in the pineapple liquid, a few pieces of pineapple on top, then other layer of cream. Continue this way until you finish up the ingredients. Cover with plastic wrap and press lightly with your hands. Refrigerate for at least 4 hours before serving. Remove the film covering from the dessert and place it on a large plate. 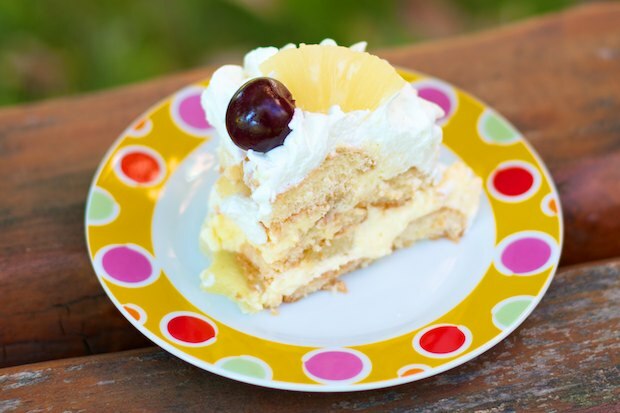 Garnish with whipped cream and cherries. Posted in Dessert. RSS 2.0 feed.